Last weekend was a joint baby shower for my good friend Jill and her friend Sally. I wanted to do something fun for their gifts, so I decided to try my hand at DIY diaper cakes. Here’s the one I made for Jill. The bottom layer is a polka dot blanket she registered for, followed by a layer of diapers. In the center (the dark brown with the white polka dots) is the crib bumper she registered for with ribbons tied around the middle for a little added color. And I topped it all off with a cute little teddy bear. And here’s the one I made for Jill’s friend Sally who is having a boy. Each layer is filled with little diapers that I rolled up, surrounded by receiving blankets, some grosgrain ribbon, and held together by little blue diaper pins. They were so much fun to make, and a hit with the moms-to-be! Way cute D! Love it! Very nice! And they way you made them is so clean and simple! Great twist on the diaper cake! Just the inspiration I needed for an upcoming shower! Those are great! 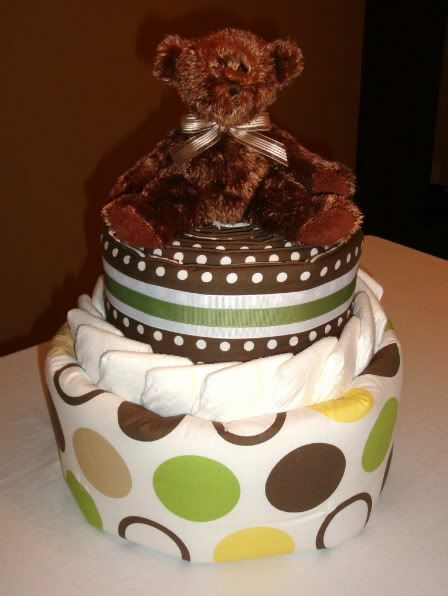 Diaper cakes are such a fun gift, there are so many options. These are ADORABLE. You are very clever. so cute D!!! I did not know Jilly was pregnant! that is too cute:) give her a big hug from me. when is she due? i’ve seen those before and thought they were a great idea – but yours are the cutest and best-put-together ones i’ve seen yet! You are the cleverest ! If I was having another bebe, then I’d fly you out as a guest at my shower for sure, just to get one of those ! But, I’m not. No more babies. So I’ll live vicariously. Cute! I’m planning to make a diaper cake for a friend’s shower that I’m giving in August. Love the unique details with the blankets and everything! Super cute D! I bet the girls were ecstatic! GREAT idea and the execution is BEAUTIFUL! Those are so adorable! I maybe have to borrow this idea if my friends ever start having children! Fun! Love the idea… your blog is great! So, so cute and creative! Waaayyy better than the first one I made. These are so adorable! I doubt I could ever make ones that look that cute! Hi! I’m stumbled upon your site when searching for green and brown baby items. Is there any way you can ask your friend, Jill, where she got those receiving blankets? I love the polka dots! I’d love to find them! I’d appreciate it so much! Thanks everyone! Your comments are all so sweet! @Ginny–Yep, Jill is pregnant! She’s due November 16th. The shower was held last weekend b/c Sally (who’s due in October) lives in Kentucky and won’t be back in town until after the baby is born. Sally was in town last weekend, so their girlfriends decided to throw them a joint shower then. Exciting times ahead! @Lauren–the green and brown polka dot bedding is from Target. That bottom “layer” isn’t a receiving blanket though, it’s more like a mini baby comforter. Hope that helps! Sooo cute. I love the idea of making some of the layers the gifts from the registry – it’s all about the packaging, ya know? Brilliant. 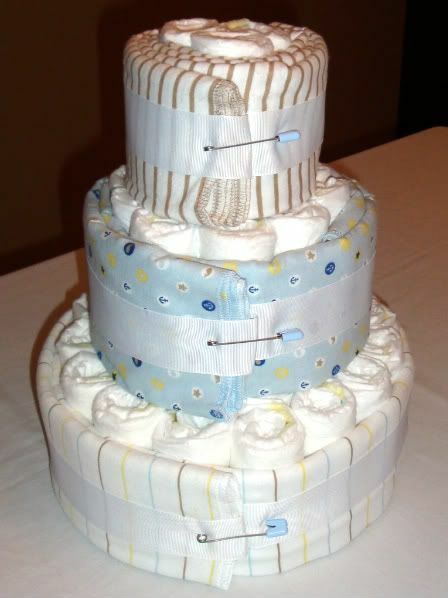 Love the diaper cake, this is so clever! !